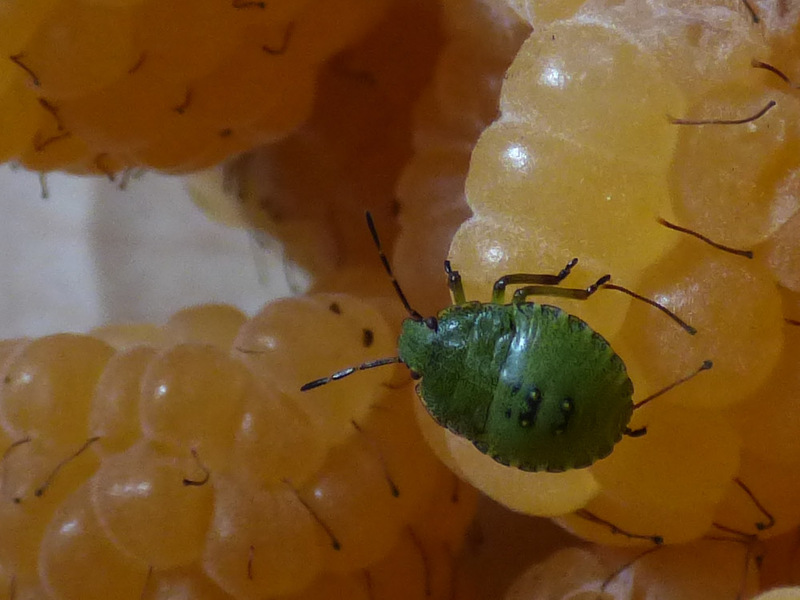 Two of these little fella/girls popped up from amongst the yellow raspberries that I picked yesterday. They were smaller than my little finger nail and I have small fingers. Eight years ago today, (30 August 2006) I started this blog. At that point I was just exploring what a blog was. My reasons were partly work related, partly as a way of communicating with plotters on our site and partly just because I like playing with new ideas. I had no idea that people that I hadn't personally met would read anything that I had posted and certainly didn't expect any comments (other than flippant comments from fellow plot holders on our site). I certainly didn't expect anyone to 'tune in' regularly and actually become a follower. I didn't even know what a follower was but once I became aware that people were actually visiting and reading what I had written I knew that I had to step up my game. Like everything, as you become more experienced you become more dissatisfied with the rubbish that you initially produced. You scrap things that at the time you thought were significant achievements for something better. No doubt if I am still blogging eight years from now things will have changed considerably. I didn't expect to become part of a community of bloggers - a community that extends around the world - a bit like having a group of penpals but only having to write one letter to communicate with them all. Now there are 289 followers using Blogger (will you be number 290 and will I achieve 300 this year? ), besides the 67 using Google+, 74 using Bloglovin and those who follow using email, Facebook or Twitter. I know some will be duplicates but I still find it all rather incredible. Exchanging comments with fellow bloggers also means that I feel that I have gradually got to know them as real people. I've also learned about other countries and cultures from like minded people from across the globe. 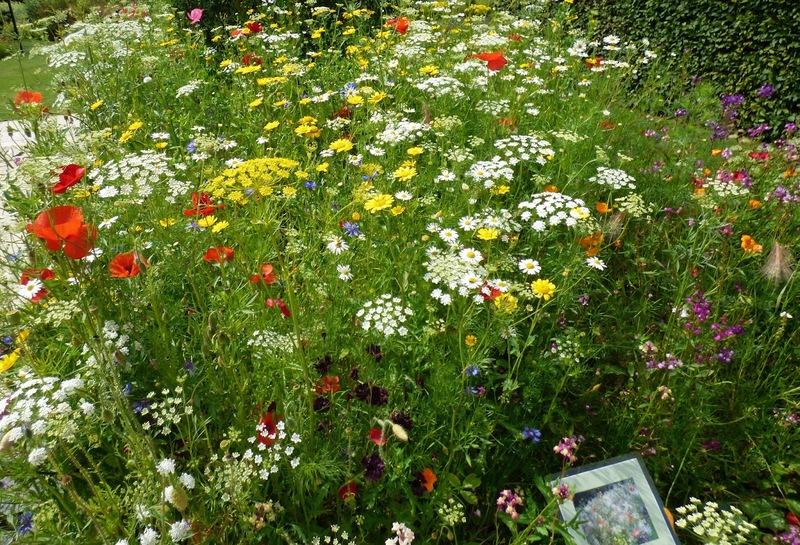 The first comment from outside of our allotment site was from Lisa and Robb from California which was a WOW. I moment. I'm happy to say comments still sometimes come from 'them'. 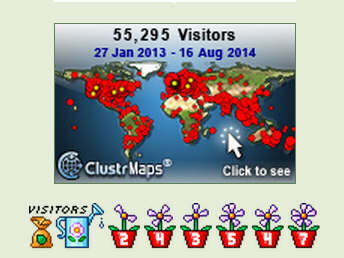 When I last looked there have been 16,365 comments - HUGE WOW! It still incites a bit of a wow when I see a comment from someone new. I always visit new commenters' blogs and find new favourites this way. Below are last week's stats. that make for amazing reading. The most important to me are the returning visitors. Many of the others could have just ended up on my blog by accident and quickly rushed off somewhere else. To mark the 'occasion' I have a couple of giveaways which are unfortunately due to postage issues only available to UK visitors, (I'm really sorry about that). 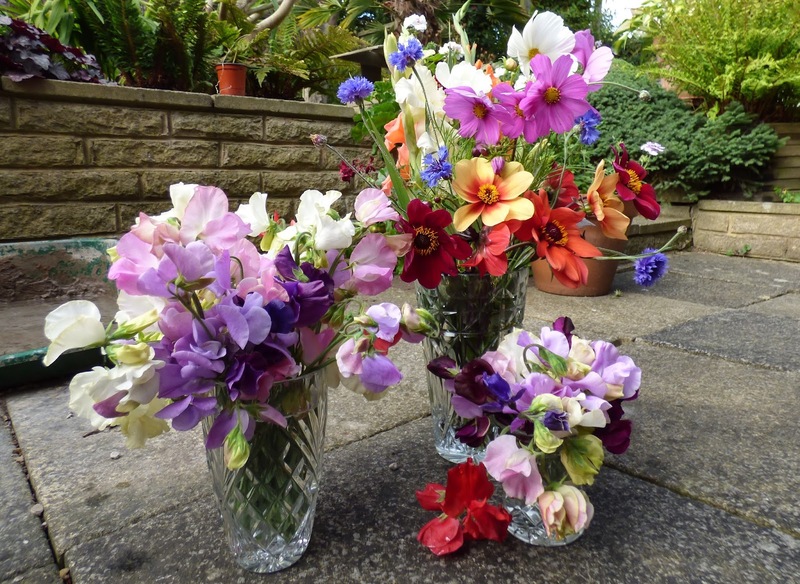 These will be sent direct to the recipient and will be dispatched later in autumn. In the event that this collection, for some reason, goes out of stock a suitable replacement will be found. 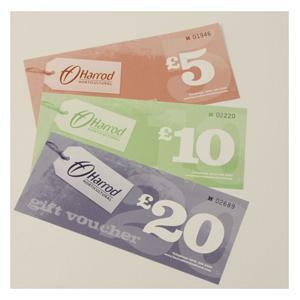 The second giveaway is a £20 voucher to spend on the Harrod Horticultural website. You can just browse the website and choose - some possibilities are shown below. If you wish you can use it towards something more expensive but remember to take P and P into account. The winners will be drawn at random from everyone making a comment below on this post. The closing date for comments is midnight Saturday 6 September and the winner will be announced on the blog shortly after. Good Luck! Thanks for reading and I hope that you stick around so we can get to know one another better. The tomatoes are steadily turning red or yellow but not to the extent that we need to freeze or use then in bulk. Not only haven't we grown as many tomato plants this year but those in the plot greenhouse have been disappointing with some plants failing to produce any fruit at all. 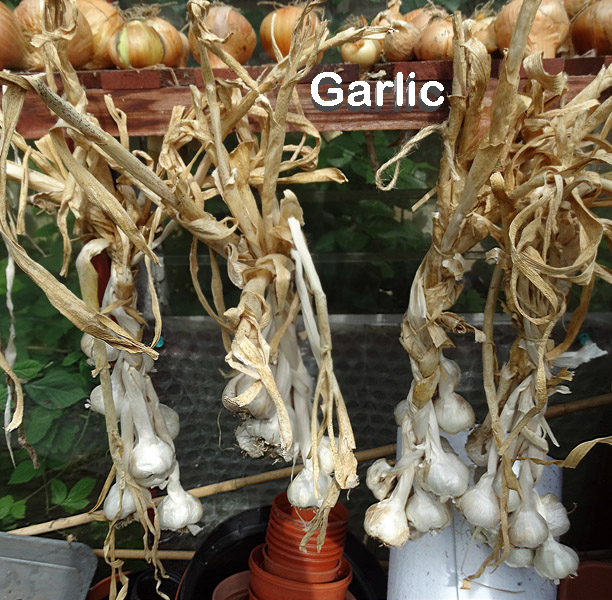 I think a couple of poor quality grow-bags were in part if not wholly to blame. Whilst the thornless blackberry crop is winding down the autumn raspberries are just starting to crop. 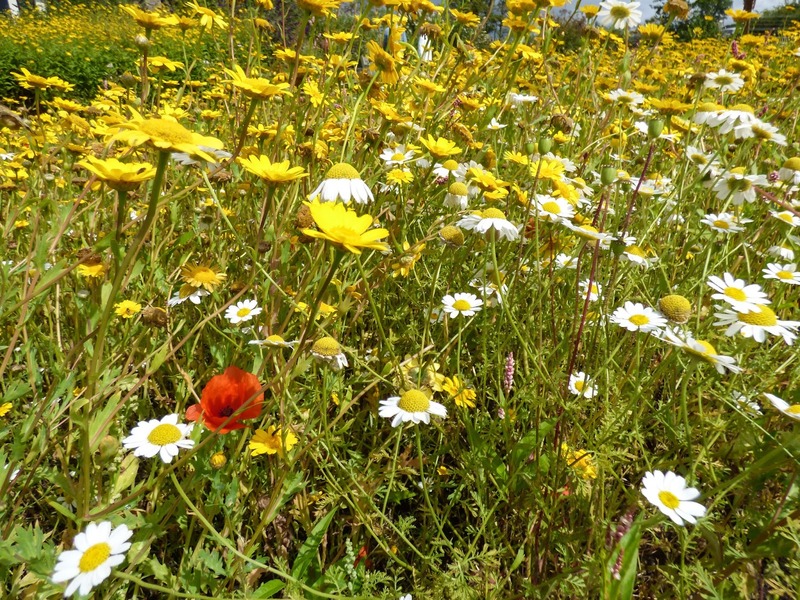 The yellow All Gold is particularly susceptible to rain and wind damage so the weather needs to improve if we are to benefit from a decent crop. The runner beans just keep on coming. Our freezer is well stocked with frozen beans and so Martyn has tried making runner bean chutney. We picked one or two Bramley apples that had fallen from the young tree on the plot and also apples that we can't identify from one of out inherited trees. 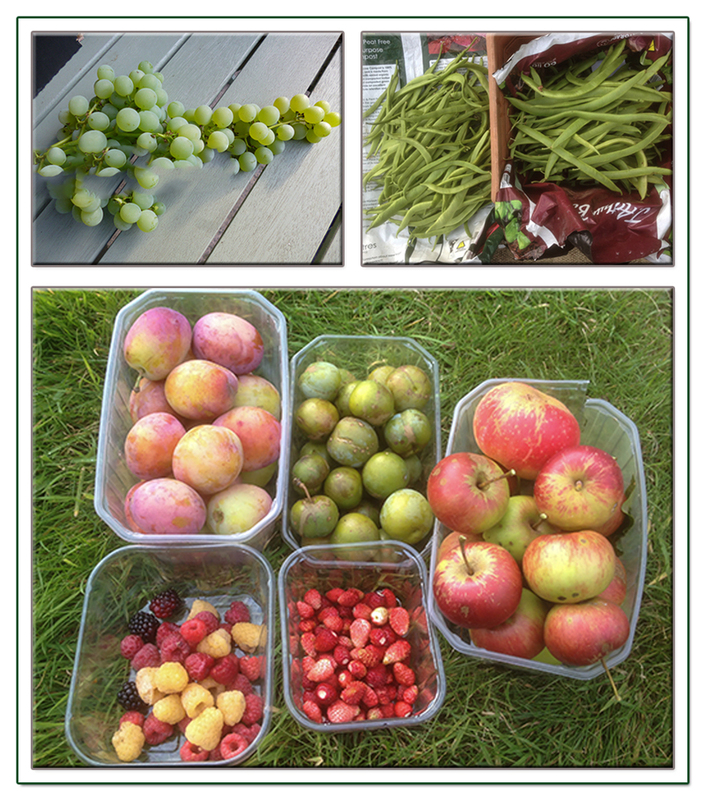 This week's greengages are Reine Claude and Mannings, the plums are Victoria. After picking a couple of punnets of strawberries from the everbearing Flamenco we may have to change our decision not to plant this type of strawberry when we plant up a new strawberry bed next year. It may never produce many berries at a given time but a bowl of freshly picked strawberries at this time of year is a treat. Another strawberry that earns its keep, as far as we are concerned, is the alpine strawberry. 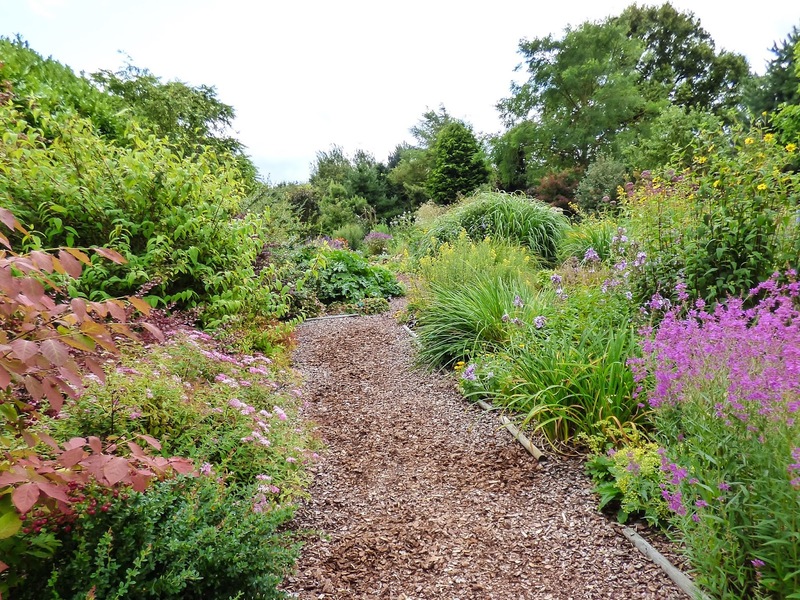 You do need lots of plants to provide a useful harvest so we use them to edge the fruit beds on the plot. I've just planted a new batch to refresh our supply chain. The remaining Charlotte potatoes have now been lifted. They had produced good quality undamaged tubers. The row of Winston that were affected by blight have also been lifted and produced a reasonable crop considering that the tops were killed off early. 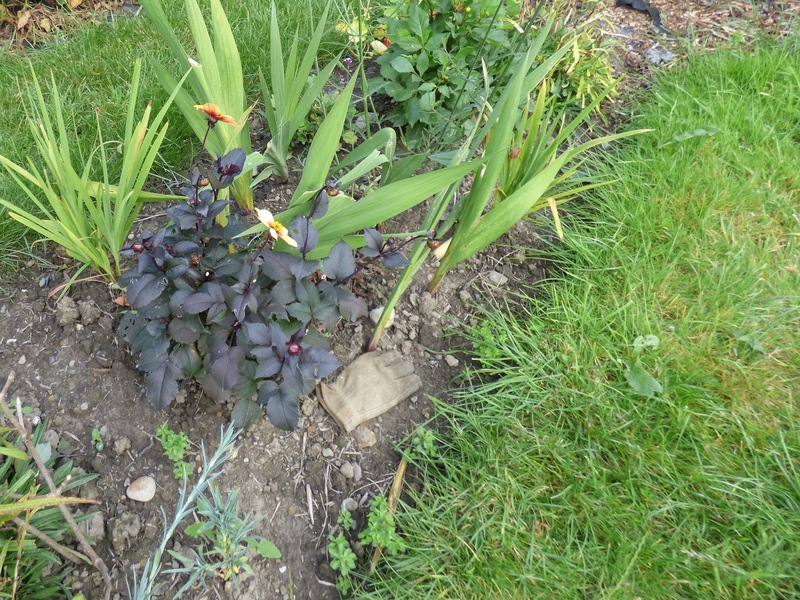 Although Winston shared a bed with other varieties that had lots of slug damage, these tubers had only slight damage. It's fascinating that a simple creature such as a slug can have such taste preferences. 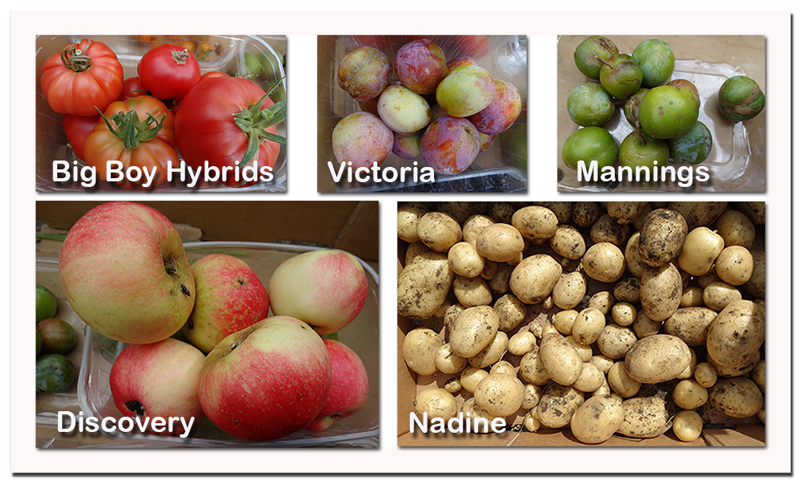 Harmony, Nicola, Nadine, Casablanca and Rocket were all growing in a bed affected with blight early in the season. Strangely although this bed didn't seem too badly affected more tubers were spoiled by blight than in the bed to suffer badly. Despite this there was hardly any slug damage and all except Rocket, which was a complete failure, produced a decent crop. Casablanca in the bucket on the right below, produced smaller tubers. As some tubers showed the affects of blight we will use these first as the lifted potatoes may not store well. 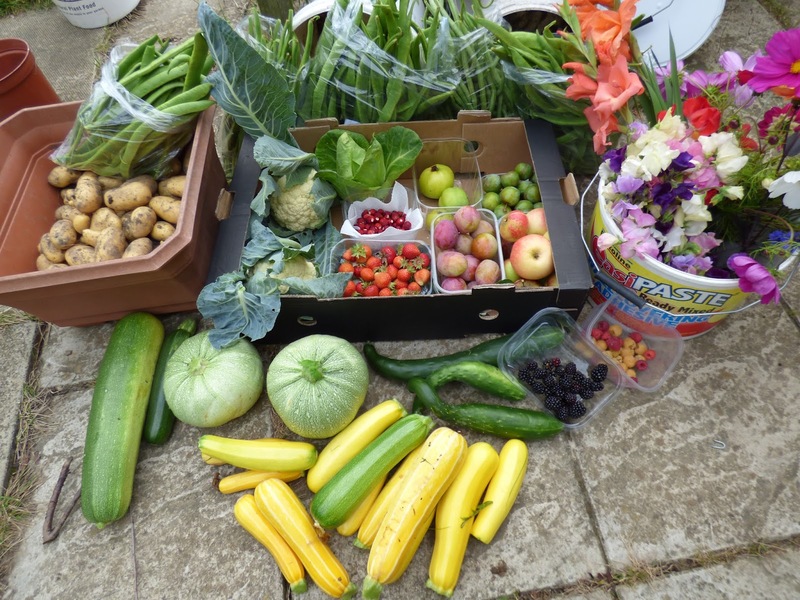 A complete list of our August harvests can be found here. Our garden isn't very big so we can't really afford to have areas that just aren't earning their keep. At the moment we seem to have more areas that are just not doing it than are. The cold farme courtyard is in limbo at the moment - it's in no way finished but is in a more satisfactory state than it has been for years and is now a productive area rather than a dumping ground. 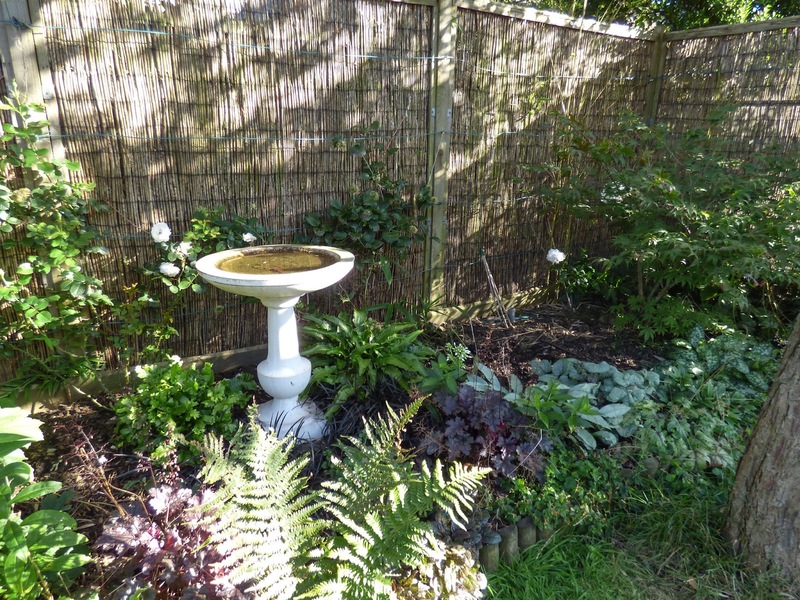 You may remember that I planted up a blue and white border. 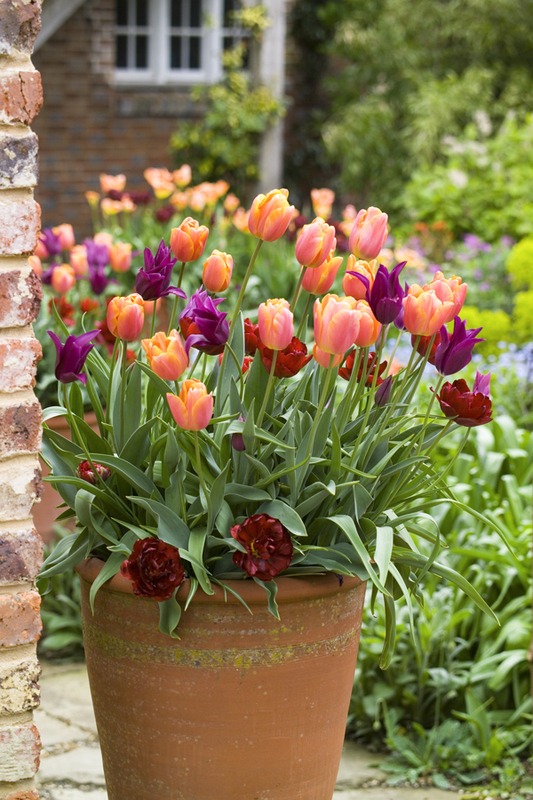 This initially seemed to be working but many plants and bulbs have just disappeared. 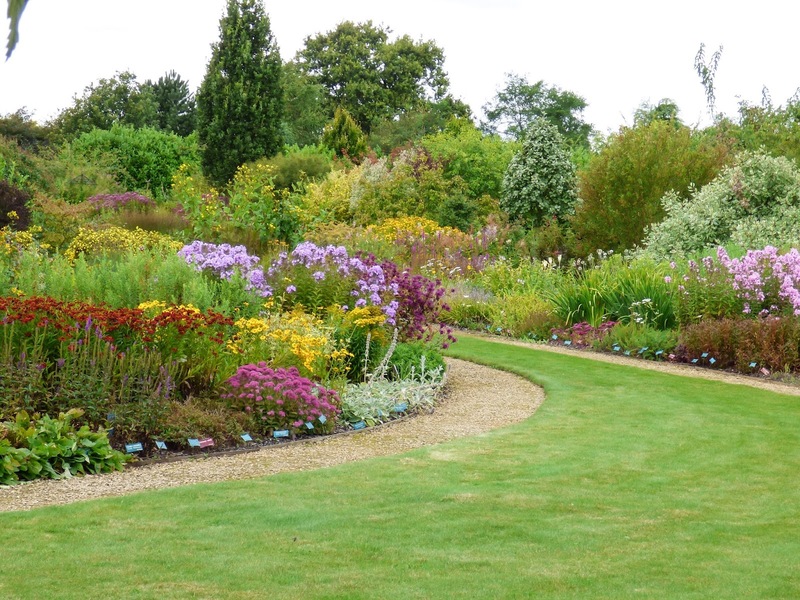 This border curves round to join another bed which is in need of a complete makeover. 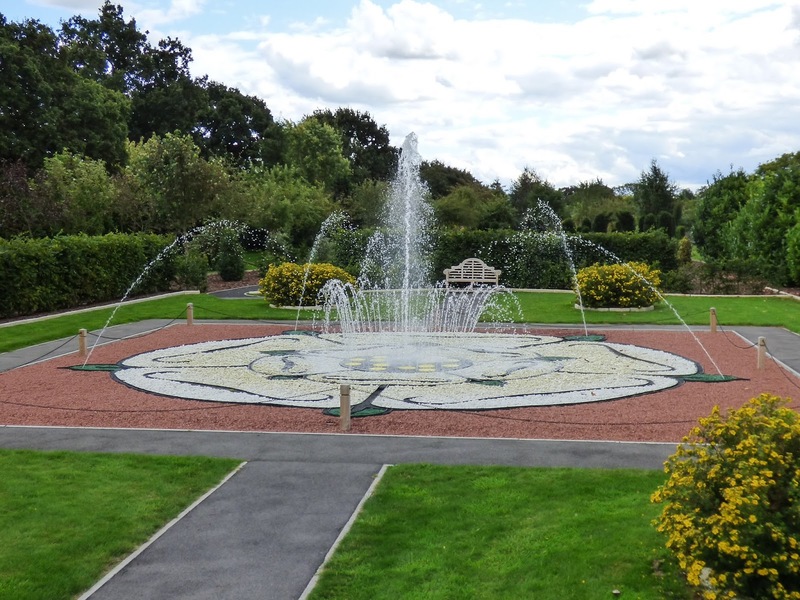 I'll go into detail about our work on these beds in a later post but for now I'll just say that we are on the lookout for perennials to plant in these areas, blue, white and maybe cream for one area and reds, yellows etc. for the other bed. 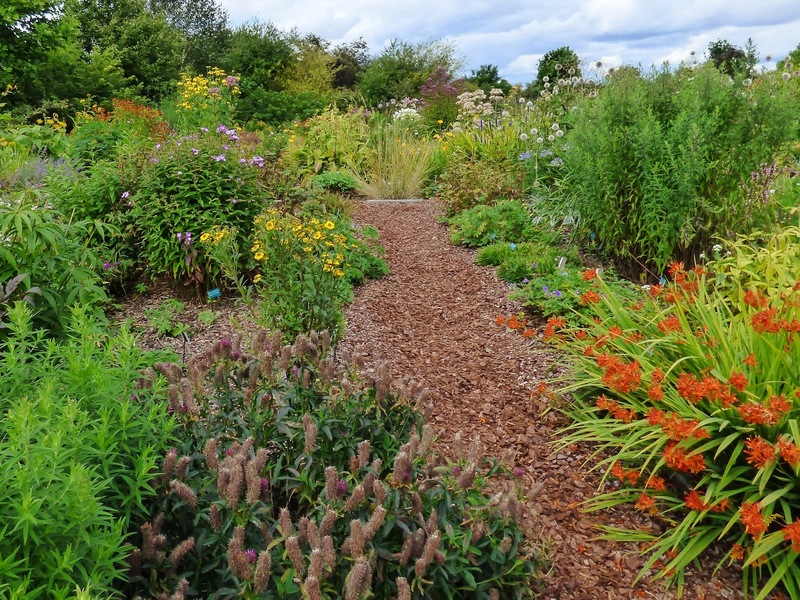 I want some perennials that will give colour at this time of year such as heleniums, rudbeckia, achilleas and echinaceas. I didn't want the standard garden centre offerings and want to be able to see the plants in flower before making my choices. 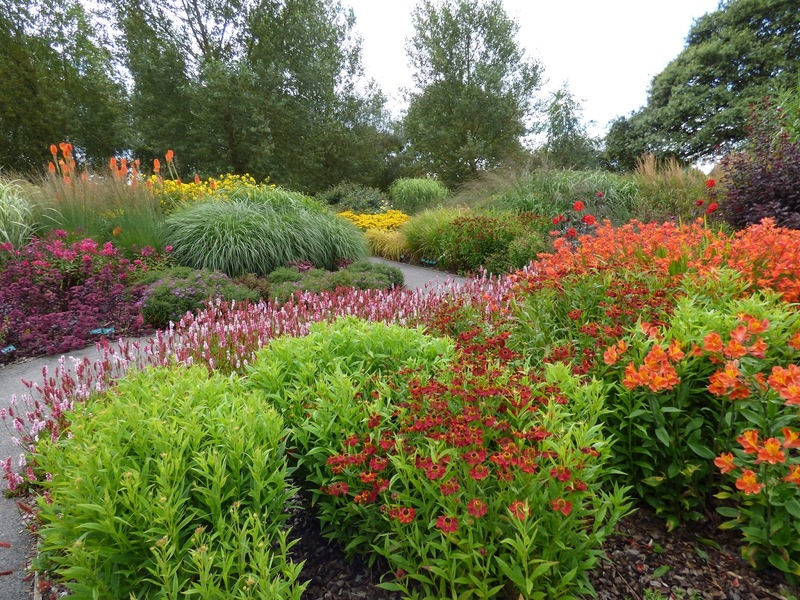 On our latest visit to Harlow Carr whilst sheltering from the downpour that cut short our tour of the garden I collected several leaflets about partner gardens. 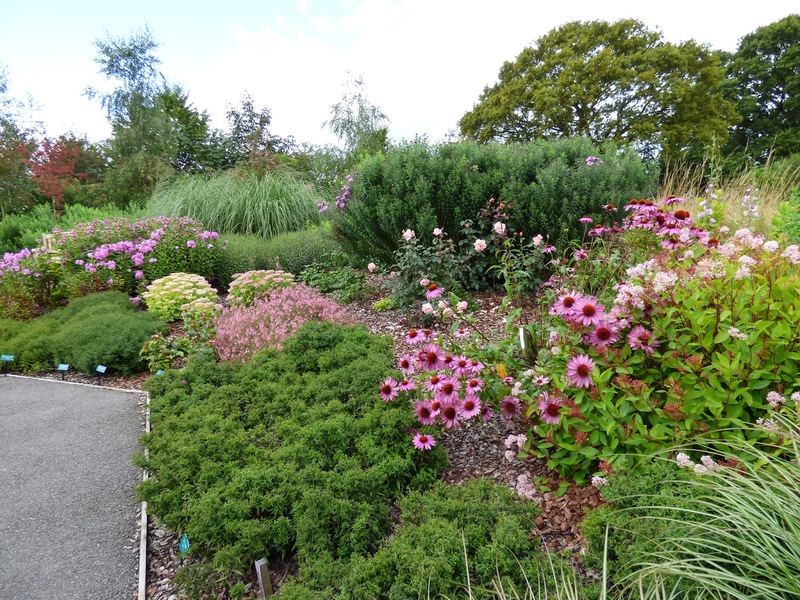 One was for Breezy Knees - a perennial nursery and garden that was described as having "over 1,500 different varieties to choose from, including many rare plants, lots of recent introductions and definitely loads your neighbours won't have. 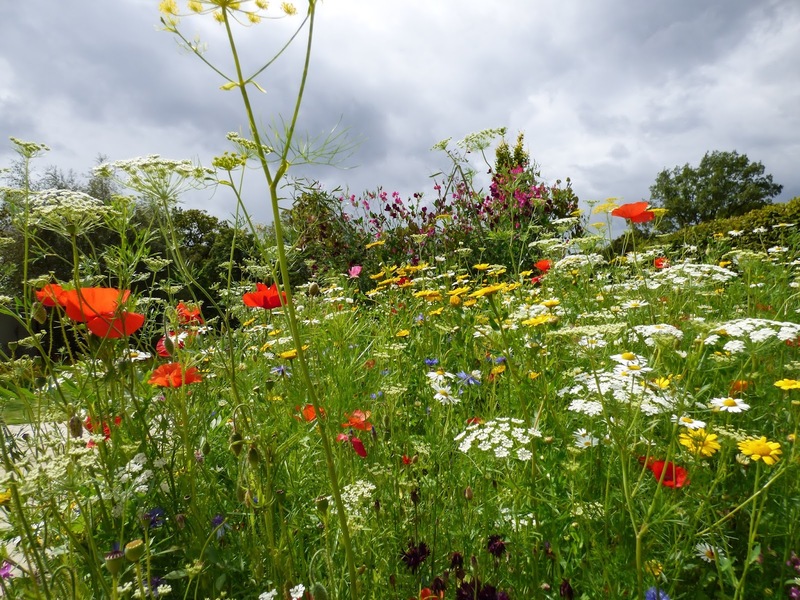 And everything we sell can be seen growing in the gardens, having been tested by whatever the Yorkshire weather has thrown at them". Sounded just the ticket so off we set on Friday all prepared to return home with a boot load of plants. The gardens were beautiful and more extensive than we had expected - well worth a visit - I'll post photos on my Wordless Wednesday post (Martyn has posted some of his photos on Facebook here) and we spotted lots that we would like all well labelled. 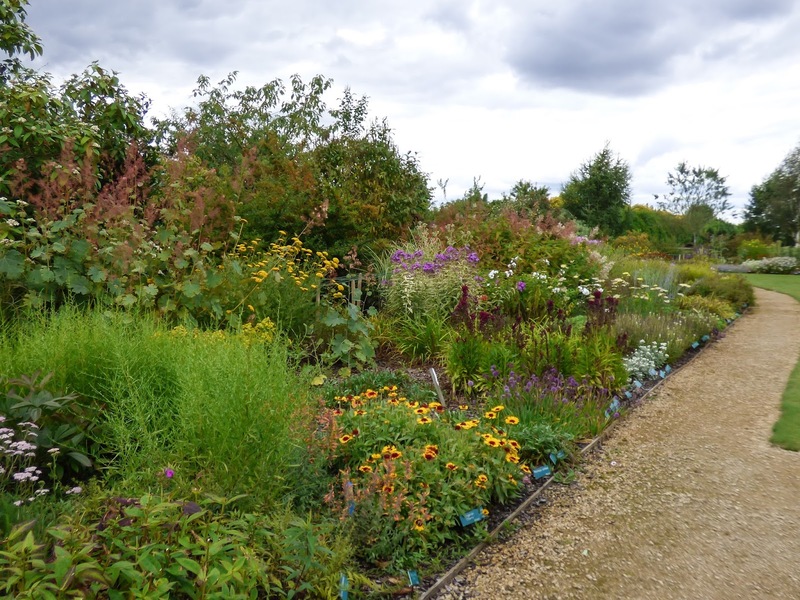 Having taken note of possible purchases we headed for the nursery in anticipation of parting with a substantial amount of cash. This was where disappointment set in - no sign of any of the plants on our list and those plants that were on sale looked well past their best. 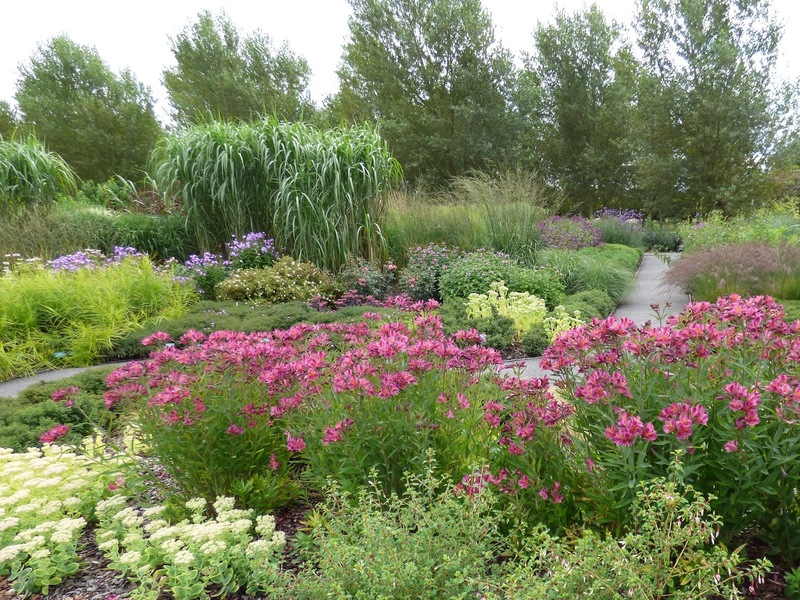 So is it the wrong time to buy perennials? Do we have to buy when they are first coming into growth at a time when we can't see them on flower in the garden? Does this mean we have to wait until next year? We just wanted to see what we liked in the garden and go and buy a plant from the nursery but this seems impossible. Interestingly in the time that we were there we didn't see anyone buying a plant. 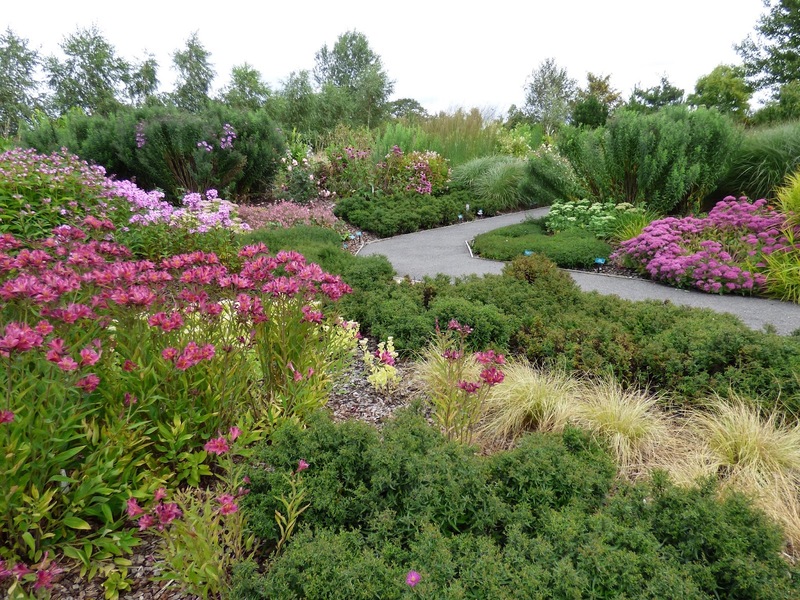 Have you any favourite varieties of perennials - not too large - that you think we should consider? 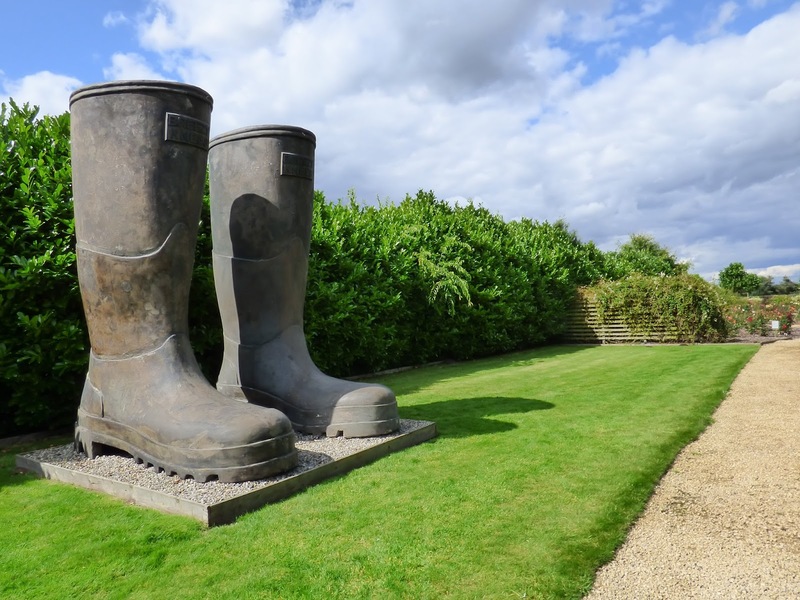 There are those gardeners who like to commune barehanded with the soil and those who prefer to cover their hands when scrabbling in the earth. The later buy gloves and the former buy hand cream or maybe just a stiff scrubbing brush. 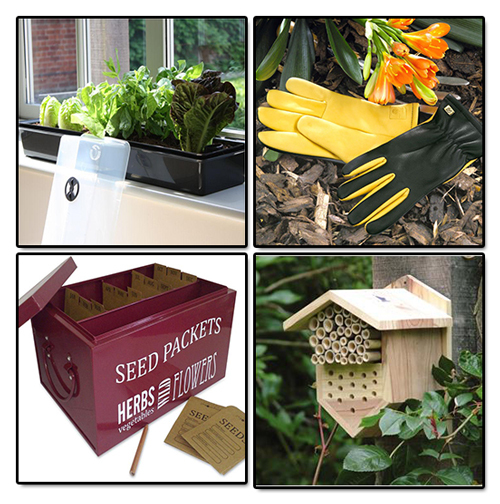 I like to wear gloves for many gardening activities and also if I have to pick up something nasty like a slug. I have a preferred brand of gloves that I have found suit me. They are made from a soft leather that is supposed to be machine washable - not that there is any way that I would put mud caked gloves into my washing machine. They can however, be rinsed and don't dry into a stiff unyielding claw. 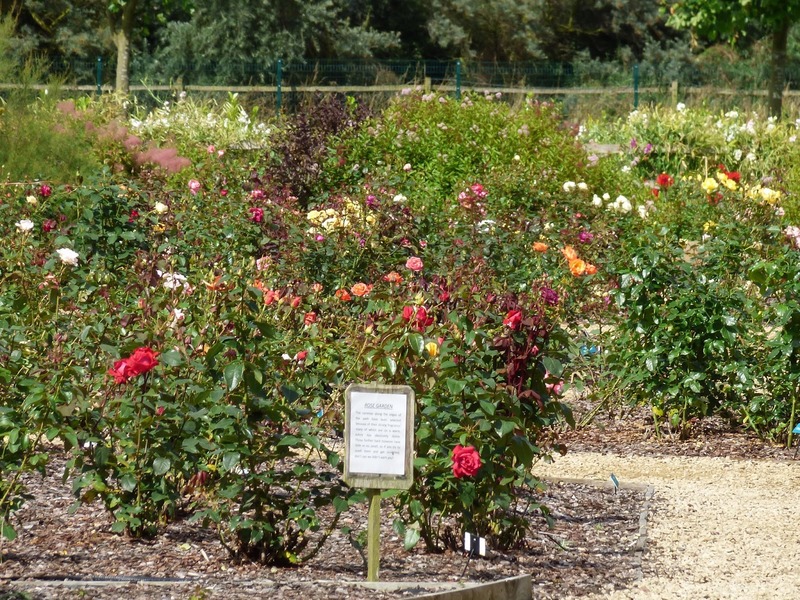 There has been a problem though in that the garden centres only seemed to stock them in colours described as olive or grey, in effect this translates as colours designed to camouflage well when placed on soil. 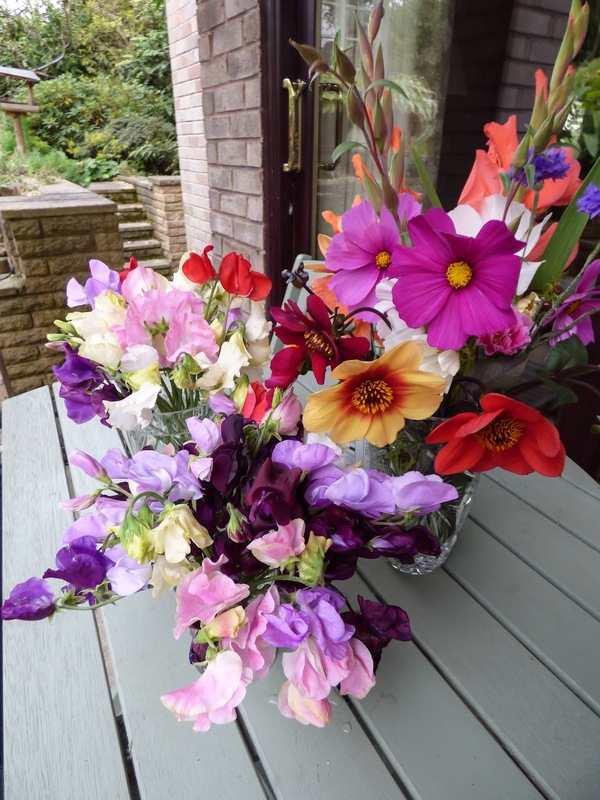 Maybe the buyers feel that we gardeners would prefer these earthy colours which in other circumstances maybe I would. Although I do like to wear gloves for many gardening tasks there are times when I need to work barehanded on fiddly jobs that need a more delicate touch. This means that when I am working gloves are regularly being taken off and placed (OK maybe thrown) on the ground. I then wander off and forget where I have left them causing me later to have to wander around retracing my steps in an attempt to locate the missing glove (it's often just one). Sometimes I accidentally bury a glove and don't find it again until it is dug back up. Now I know that I could buy girlie gloves in fluorescent colours maybe even decorated with daisies but these either don't offer sufficient protection against the more vicious plants or they quickly become wet and soggy or they are rubbery and make for sweaty hands. Recently when searching for replacements to my present gloves, (being buried didn't do one of the pair any favours), I spotted my favourite gloves in bright pink. Now isn't this easier to spot that the one above. The only problem was that the pink gloves were not available in my size - small - so I ended up with a pair of medium ones which I will be able to manage with for most plot jobs. Later I browsed the Internet to see whether there were any small size pink gloves online and I found that they also came in what was described as lavender. 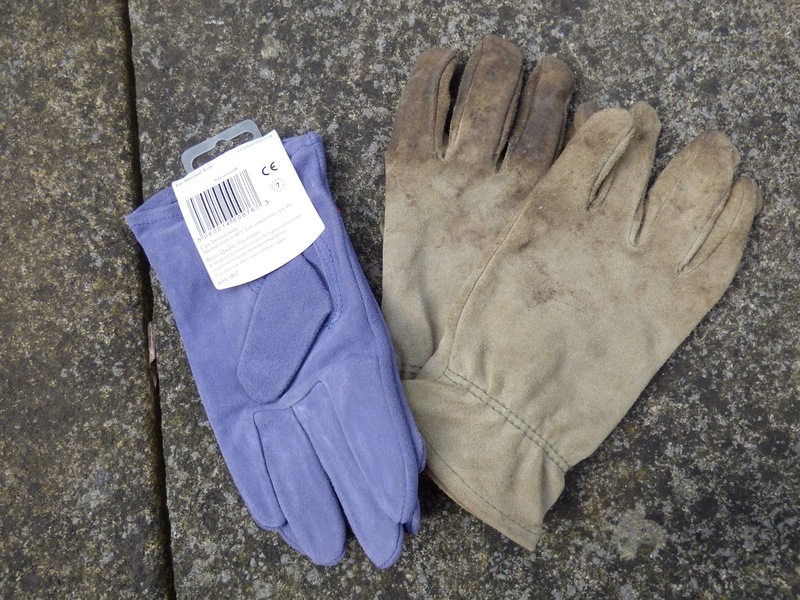 Eventually after the carrier had lost one pair, a pair of small, what I would describe as blue, gloves were added to my gardening wardrobe for use in the garden. I'm hoping that my latest purchases don't fade to earth coloured after regular use. It's not just gloves that I have problems with. 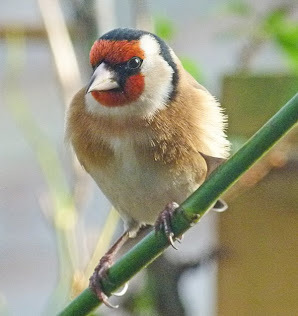 There are other items that regularly play hide and seek with me when gardening. I'm always putting scissors down and recently hit on an idea to help locate them - red ribbon tied to one handle. Now I wonder would reading glasses look really ridiculous if I tied a piece of red ribbon to them? This week we have only been to the plot twice. 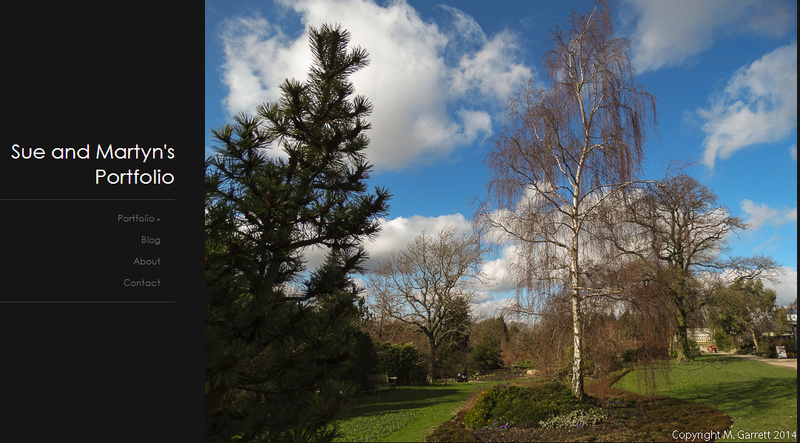 The plants are being battered by strong winds and whenever we are there we have one eye on the gathering dark clouds that can decide to suddenly empty their contents at any time. At other times the sun will shine giving a false sense of security. Harvesting has to be done quickly punctuated by dashes to the shed to take cover. Martyn is gradually lifting potatoes, those below are Nadine weighing in at 21.8kg ( just over 48lb). These never succumbed to the blight and the tubers were in good condition with only minor wireworm damage. We picked our first lot of greengages - Mannings that so far have been bug free. We planted greengages, some years ago, when we had all our plums stolen just as they had ripened. We had tasted greengages and knew that they were sweet and delicious in spite of looking unripe and thought maybe any would-be thieves would be fooled by the appearance. 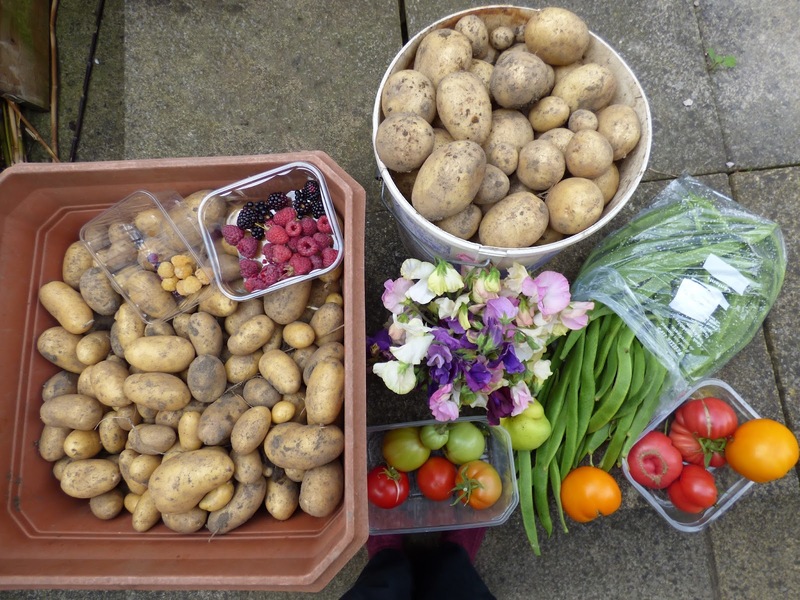 This year's pickings may be blemished but they still taste good. We have also picked a few Victoria plums, but not all of these have escaped the plum moths attentions. Maybe they are fooled by the greengages too. The apples are from our inherited apple hedge so we are only guessing that they are Discovery. Technically they are not fully ripe. Some are quite small and have bits that need chopping away where something has had a little nibble. They are still tastier than those offered by the supermarket. 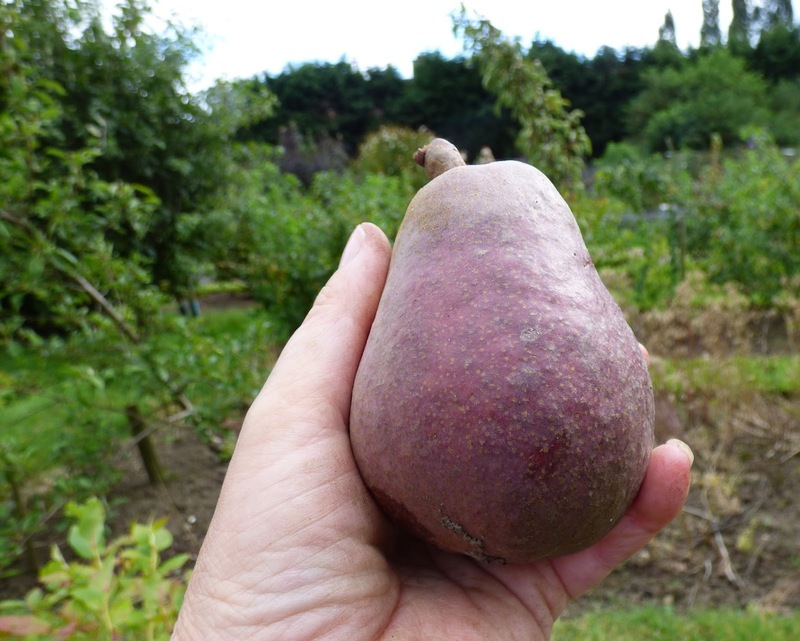 We picked this Red Williams pear from under the tree. Where there were three pears there now are just two. The fruit is still rock hard so we will have to give it time to ripen. After this weekend's gales the other two are probably also now under the tree rather than hanging from it. Although we are now beginning to harvest other tomato varieties, Sungold is the star of the season. What the fruits lack in size they certainly make up for it in taste. 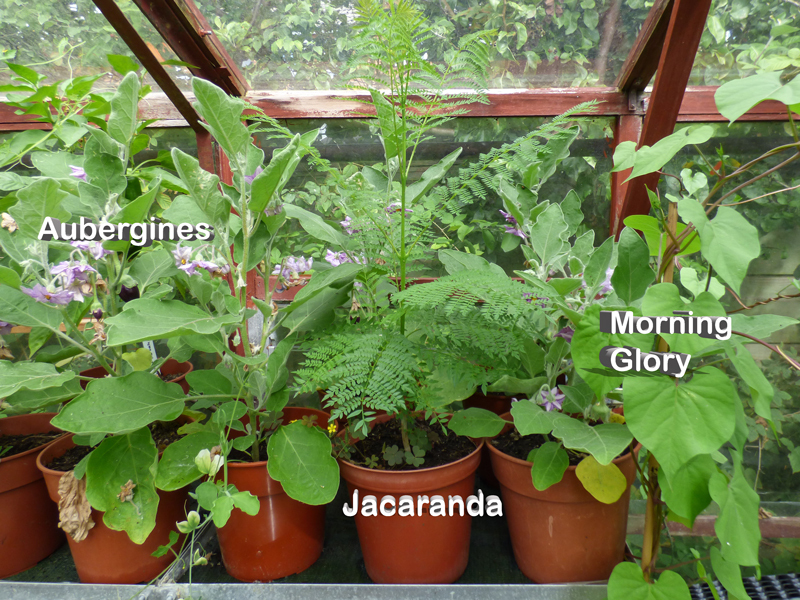 Another revelation, thanks to Jo who sent us the packet of seeds, are the Mini Munch cucumbers. 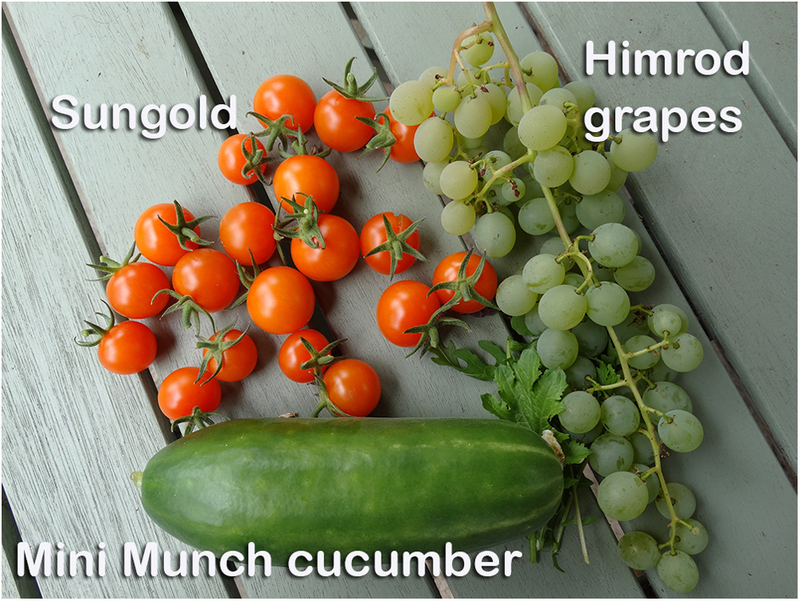 At just under £4 for six seeds we wouldn't have tried them without Jo's giveaway last year, after all we thought, "A cucumber is just a cucumber isn't it?" We were wrong Mini Munch is crisp and the flavour knocks the spots off the larger ones. 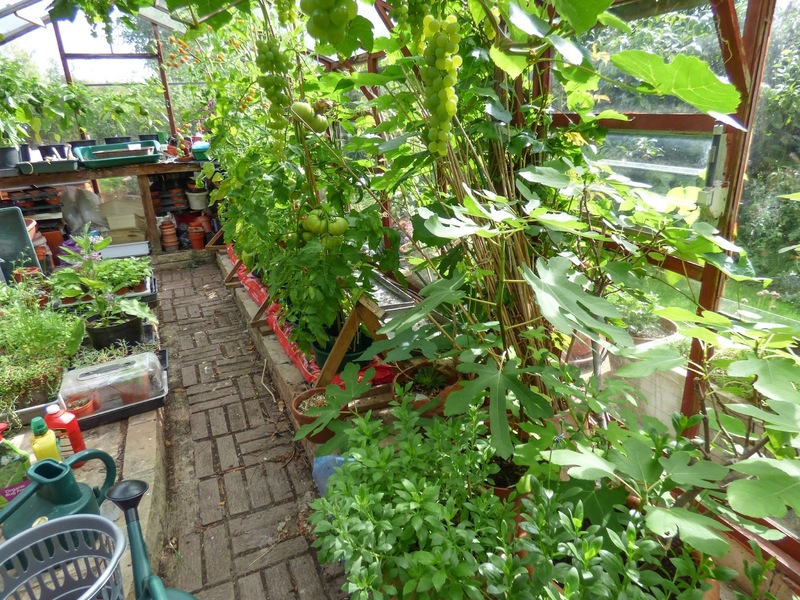 We've started picking grapes from the garden greenhouse. The bunch above was minus one fruit which Martyn had already picked for the taste test - it passed. The beans just kept on coming but I wonder for how much longer as after Sunday's gales they are likely to have been flattened, I don't think the flower beds will have fared too well either. 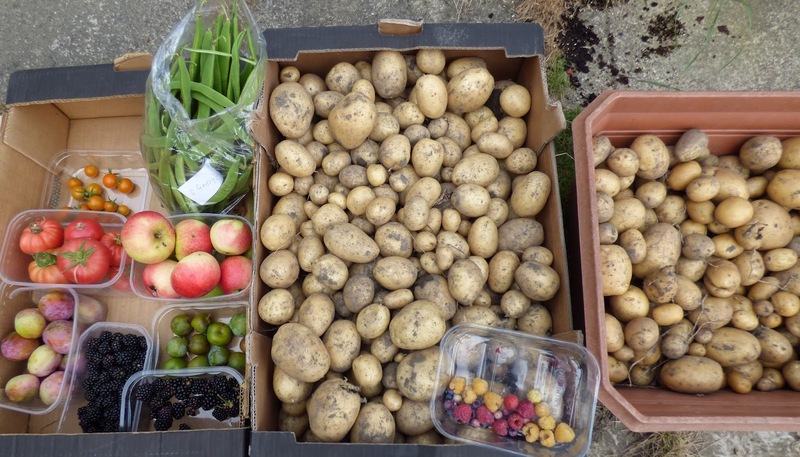 The second lot of potatoes lifted this week were Charlotte, a dependable variety that didn't fail; 7.67kg (just over 17lb) of medium sized, undamaged tubers were collected. A surprise harvest came from the ever bearing Flamenco strawberries. Not only were we surprised to see that the plants had produced berries but these hadn't been beaten to a soggy pulp courtesy of the heavy downpours. The gathering of alpine strawberries was no surprise as the plants usually produce fruit up to the beginning of November. The autumn raspberries have set fruit, now we need to wait and see if these will ripen or be spoiled by the sudden deterioration of the weather conditions. So far we have picked only a sprinkling of ripe berries. 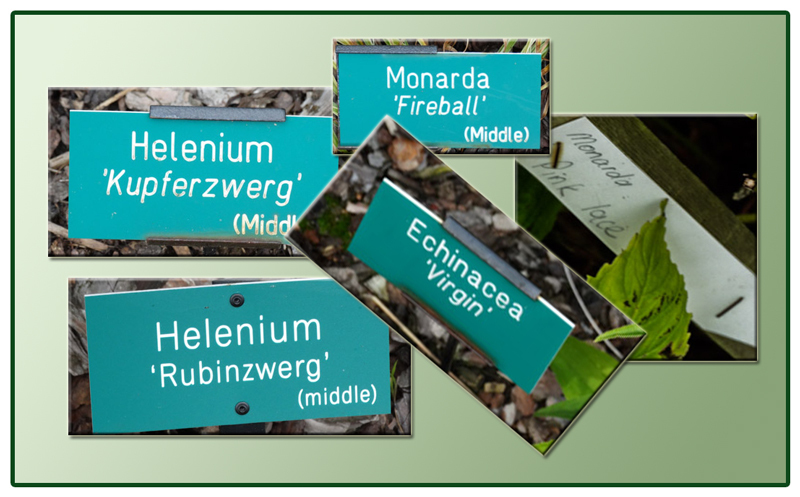 This post is especially for Snowbird who I know likes to have a peek inside greenhouses. Now let's pop inside for a closer look - starting at the left and moving round in a clockwise direction. 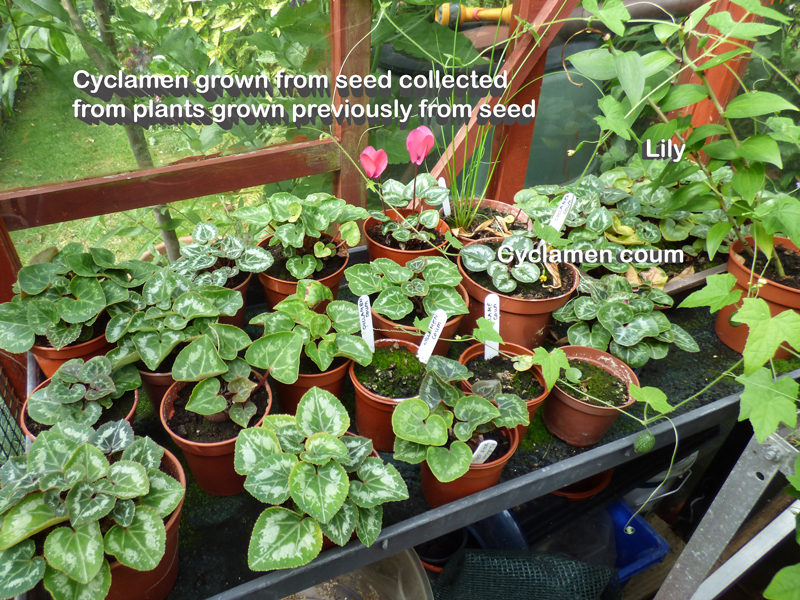 Just inside the door are the cyclamen raised from seed collected from a cyclamen growing in the house. They have really healthy looking leaves. One is starting to flower. Mixed in with them are cyclamen coum which I still need to find a space for outside in the garden. 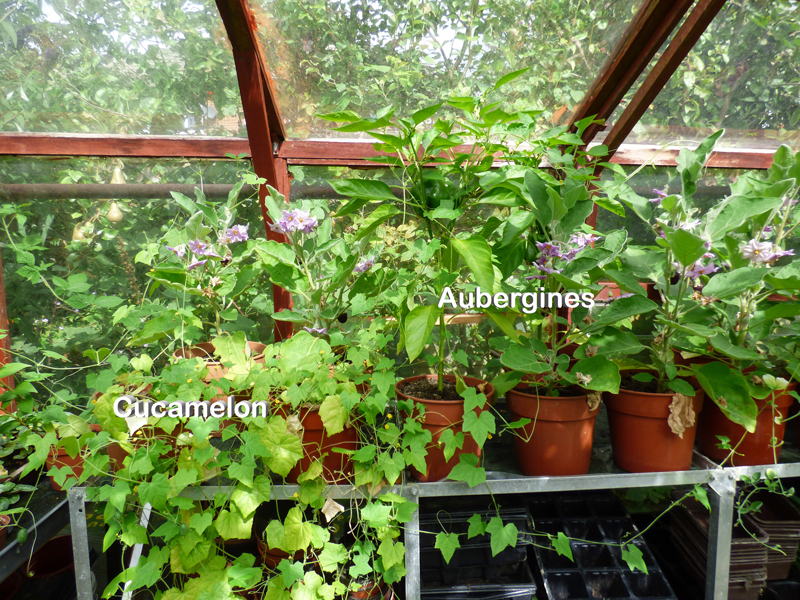 Moving round we come across the rather straggly cucamelon which has neither earned its place inside the greenhouse nor outside either on the basis of edible production or ornamental value. If ever their was a plant that didn't live up to all the hype surrounding it - it was this one. Moving along the shelf there are more aubergines and you may be able to spot the odd sweet pepper. The jacaranda was grown from a seed by our ex-plot neighbour. It had been on a window sill in the house but began to suffer badly form aphid attack and was relegated. 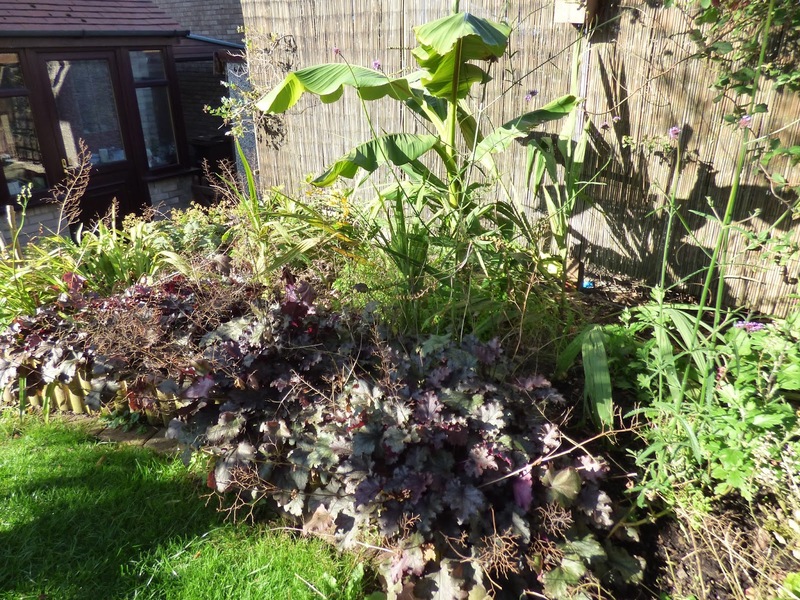 It looked very sickly and so was cut down almost completely and popped into a larger pot to take its chance. It has certainly surprised us as after a period of inactivity it started to grow strongly and is now about four times as big as it was. 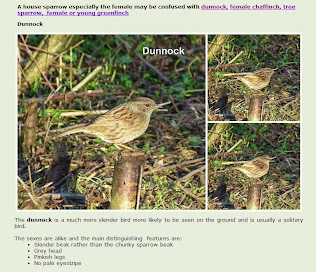 We now need to find out where it can live over winter. If we cast our eyes down to the floor you can see where the morning glory shown on the far right of the photo above is growing from. It is producing lots of healthy growth but no flowers. This is the only surviving seedling from the packet of seeds sown. 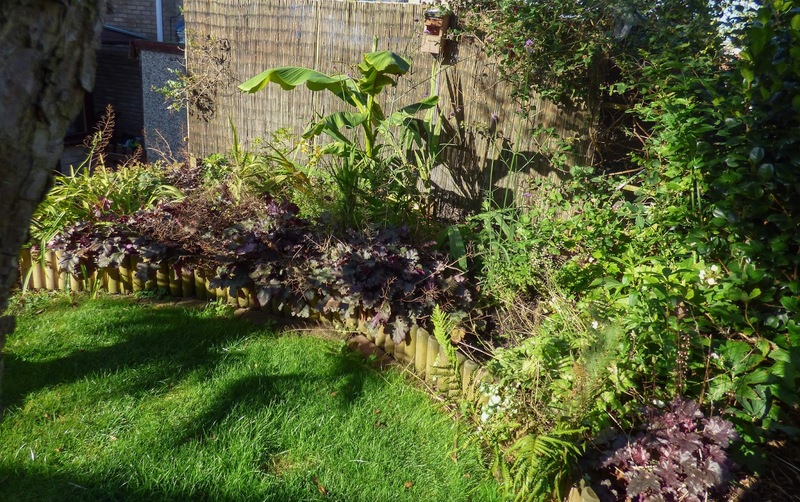 There is some overlap between the above photo and the next one but on the far right are the alpine strawberries that a ready to be planted out and lavender cuttings that have already rooted and so been potted up. 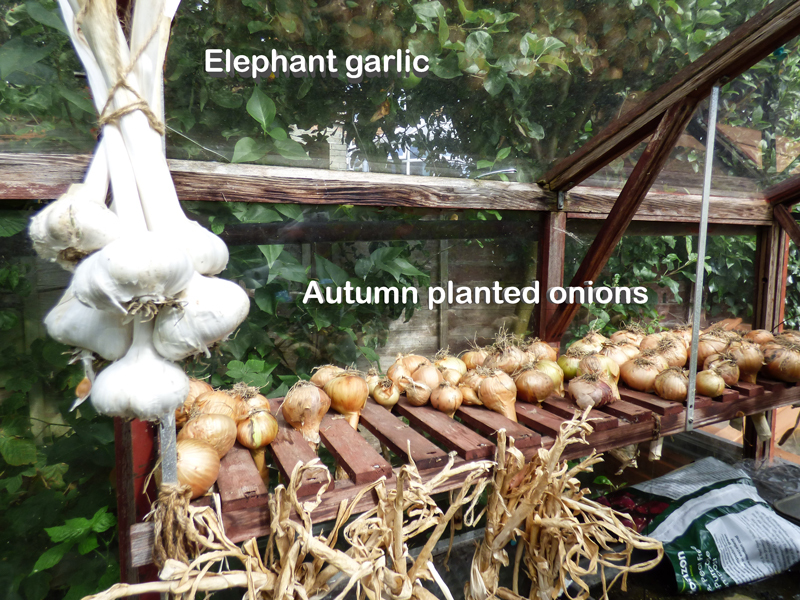 Now looking upwards to the high shelf - the small elephant garlic hang alongside the remains of our autumn planted onions and hanging from the shelf is the ordinary garlic. 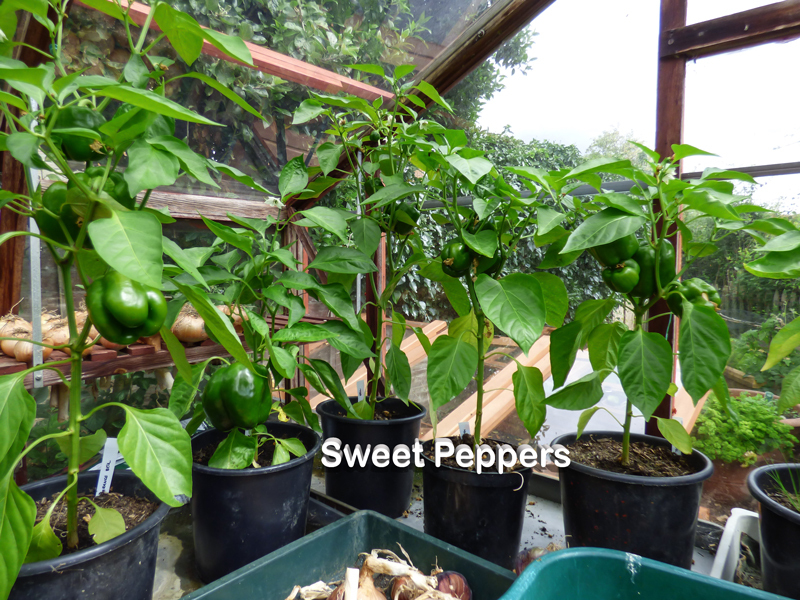 Moving clockwise the workbench at the far end of the greenhouse is home to our sweet peppers. Here we have a mixture of Orange Bell and King of the North. 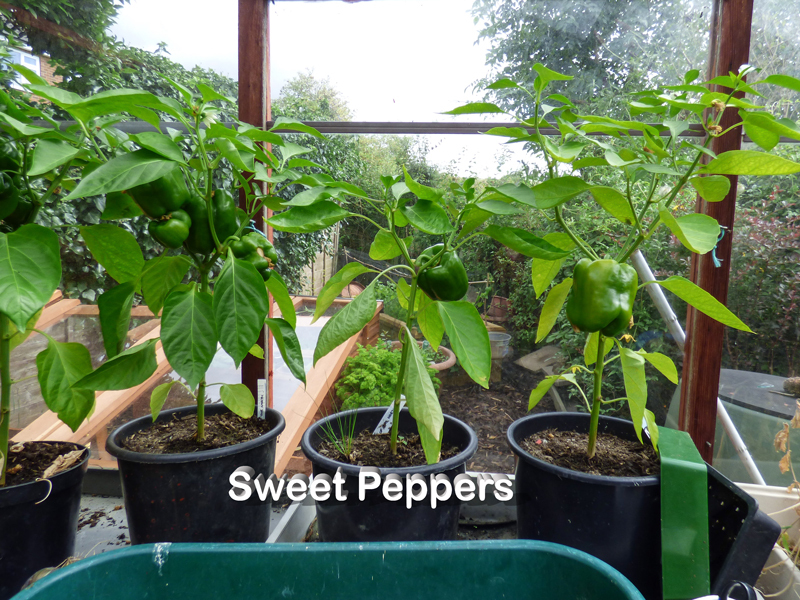 All the peppers are growing far better than bell peppers have done for us previously. We think maybe growing fewer tomatoes has meant they have had better conditions to grow in and also have been given more attention. Swinging round clockwise we now have our nine tomato plants. 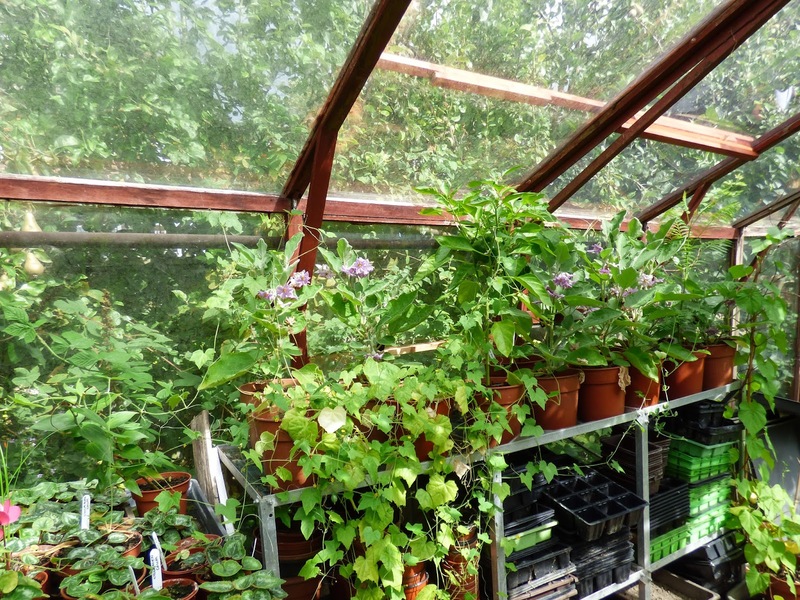 This year there has been no sign of blossom end rot in this greenhouse, although there is a fair bit of ripening to be done. 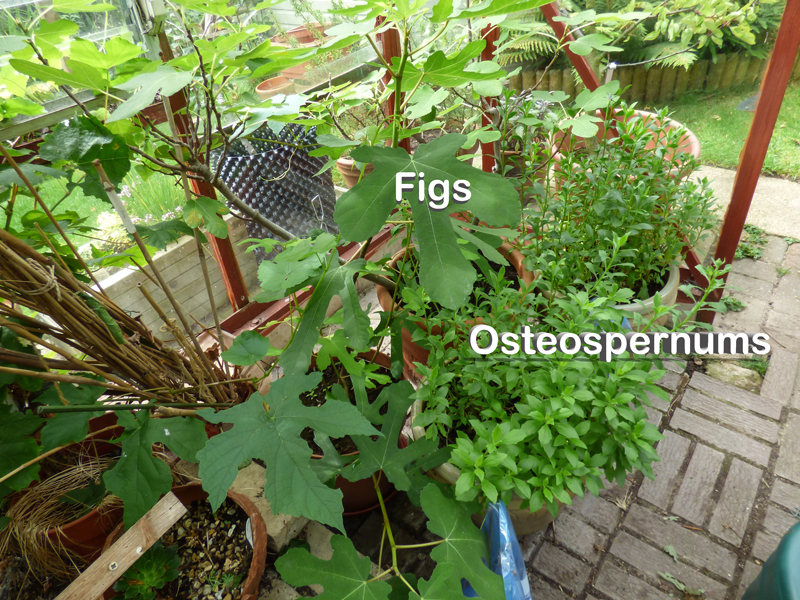 Then just inside the door are our figs - now minus any fruit and the osteospernums minus flowers. 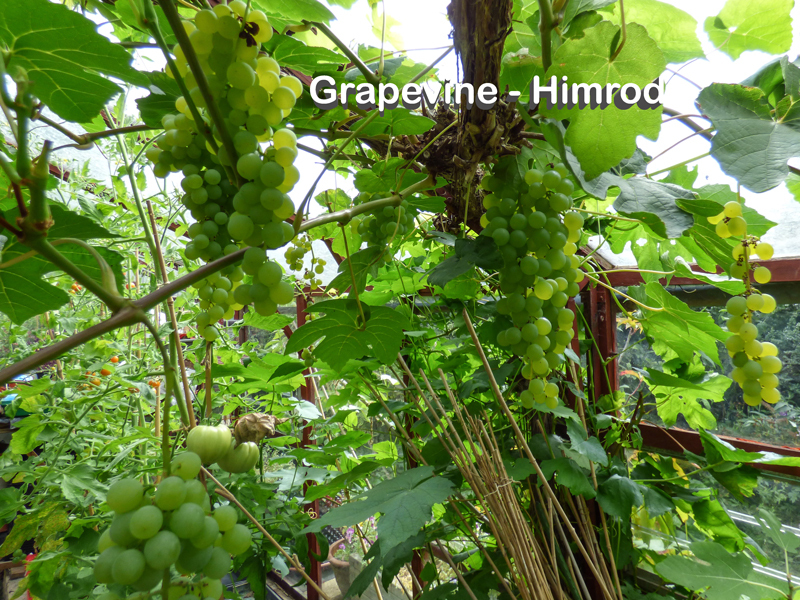 Lording it above all the other plants is grapevine - Himrod - laden with nearly ready to eat grapes, It's just a matter of keeping up with the taste test to determine when they are sweet enough to pick. 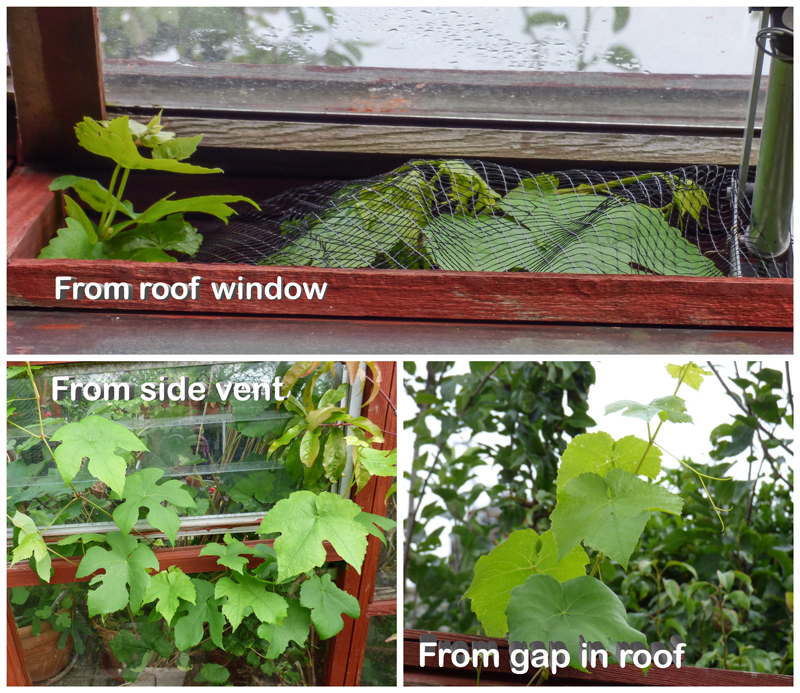 The vine is making a determined attempt to escape the confines of the greenhouse and explore the great outdoors. It's attempt to escape through the roof window is thwarted by the netting that was put in place to stop birds getting in and consequently becoming trapped inside unto we spotted them and coaxed them out. But where there is a vine they will find a way. It has even found a small gap in the roof. This escape attempt will need dealing with before damage is done. I guess my next update will be quite a different picture. 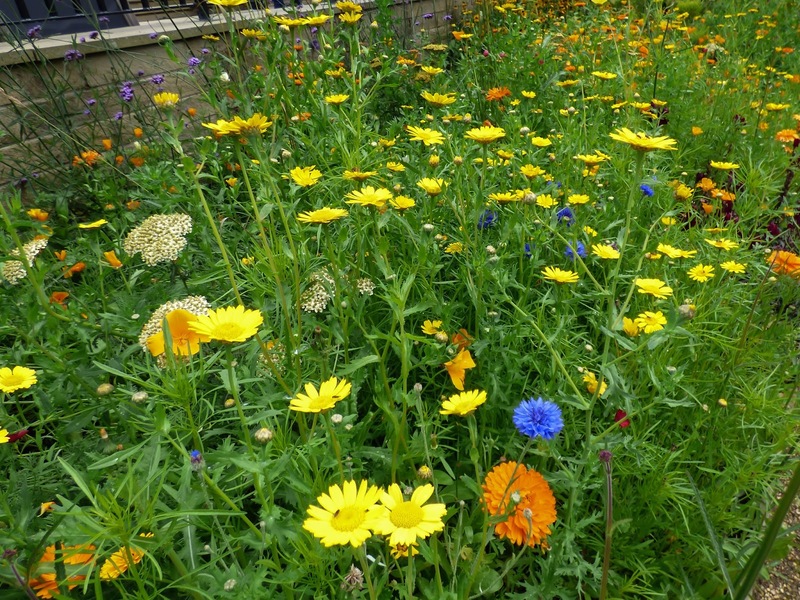 Annual flower bed - an Improvement on last year.